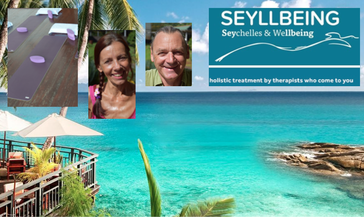 Nature Seychelles is at Roche Caiman, between the big petrol station and Eden Island. Driving towards Eden Island, there is a roadsign 'Sanctuary' on left side. Turn left and follow the small road to the end. ...probably sounds familiar, but what is it exactly? 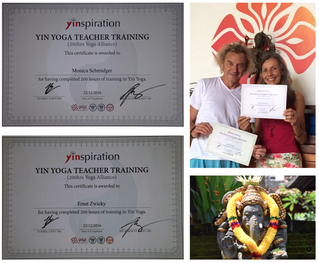 Generally, it is a gentle, healthy and adapted to the persons anatomy style of yoga. So many styles of Yoga are flourishing in the West, and all bring wonderful benefits. 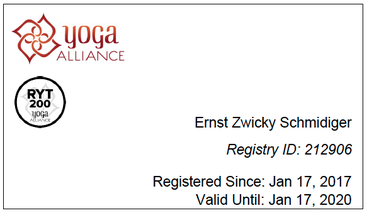 Ayuryoga is a unique, (dosha-) balancing style of yoga based upon one’s individual constitution. Using traditional asana, pranayama, mudra and mantra, Ayuryoga emphasizes the individual in developing a protocol that can be used on its own or at the beginning or end of a longer asana practice from any tradition. With an emphasis on engaging with Patanjali’s yamas and niyamas to promote harmony in relationship with self and others, Ayuryoga holds the potential to bring radical transformation and mutation of body, mind and consciousness. Yoga exercises encourage fun in moving and increasing awareness of the body. 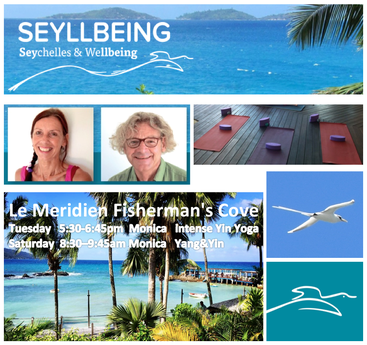 The holistic approach , the Asanas (body-training), the Pranayama (breath training) and Dhyana (meditation), all will help to harmonise body, mind and soul. Aim is to get a better body perception, more awareness about the own breath and a relaxed mind. This helps to manage daily life and routines in a relaxed and cheerful manner. We usually provide all material. Just bring your own towel if you need one. 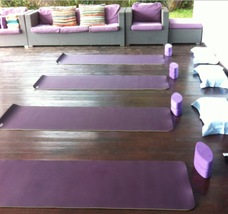 Our mats are from Manduka or HelloSun and made of 100% natural rubber and biodegradable. The blocs called ThreeMinuteEggs are also biodegradable. Bolster covers and belts are made of pure cotton. Ayur Yoga originates from the Yoga tradition of Sri Krishnamacharya and is based in the philosophy of Patanjali. 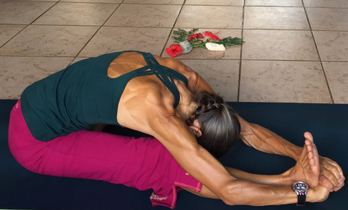 Ayur Yoga is a smooth, body adapted Yoga. It is suitable for all people, also for beginners and for people with existing handicaps. Ayur Yoga is demanding but still achievable, no peak performance or acrobatics. We attach great importance that you know your own limitations and are not going beyond them. Being regardful also means to include good breathing qualities and a good balance of effort and rest. Breathing exercises and meditation will take place in every Yoga lesson. 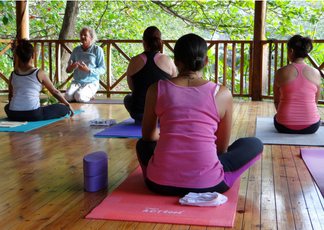 Different people have different needs and it is our mission to adapt the Yoga to the person. A Yoga pose has to come to the person, not the person has to adapt to the pose! Not only the body will be trained, but also the mind and soul. So, after the Yoga lesson, you will be keen to go out into the world and cheerfully cope with the crazy daily grind. 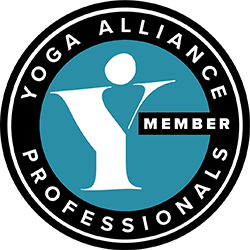 Yin Yoga is a slow-paced style of Yoga and main work is on connective tissues (fascias, ligaments, tendons). Our world is Yang, lot of Yang, too much Yang. Yang is work, activity, power, stress, restlessness, male. Take a break of Yang. Dive into 90 minutes of Yin Yoga. Let go everything, loose all muscle tensions. Forget all, even what you shouldn't forget. Get rid of thoughts, feel free and enjoy to be free. After 90 minutes of Yin Yoga, you are nurished into all cells, also your best hidden ones. You feel light like a butterfly, your awareness is kissed awake and your emotions are dancing tango.